So because I had my website layout and graphics changed, I said to myself "SELF! Keep going with the rest of your web stuff. Change the graphics on your blog too!" and I thought that was a GREAT IDEA! Only it was late at night about 10:45 p.m. So I worked, chugged along like a little super troop until I got the site looking SORT OF like I wanted to...I check it out this morning wanting to tweak some stuff and guess what I see...I want you to look at the banner, just take a look at it. See something wrong there???? Ill wait (Jeopardy theme song playing) Did you see it? OK the word designs is spelled...DESINGS... and on the bottom behind is spelled bhind. Yes...I think Ill stop doing things like that when I'm holding my eyelids open with tape! *sigh* Well back to the drawing board...or should I say Paint Shop Pro to fix those little details. I promise you I CAN SPELL, sometimes I just get to lazy to even do a spell check! Ok...my brain hurts. Ive been trying to get a blog for my new business venture...the photography side of it. I dont know what to name it. I was thinking of naming it "The Red Umbrella" Photography...maybe Under the Red Umbrella? Then I thought of Red Parasole Photography (Parasole is french for umbrella). I dont know...I have these thing with umbrella! LOL but Im thinking of something that is meaningfull, something that sounds intriguing, something that conveys that captured moments of the passing times. So I have creators block right now. I dont know...what do you think of my first idea...Red Umbrella Photography? *sigh* oh well...back to the thinking block! I started a group on Cafe Mom!!! Hey everyone...Its been busy for me with school and all, but I have found a cool site and Ive been speding most of my free time there. Its called cafemom.com OMG you all have to visit this site...they have groups for every one! I have joined so many groups that fit my "style". Like one for example is for photographers, another is to challenge your skills with web graphics. Sooo I decided to start a group there! It for those who love to make or buy custome clothing and accessories. Its called Sew Material Chicks! Yup I thought of it all on my own...I know I know its a great name!!! ROTFL. So if you fit into any of the buy or sell categories join my group. You know I realized something about myself today. I love new gadgets! I really do. If there is a new program out there that piques my intrest I buy it. I have my Rebel XT, I have my laptop and now I have a PSP portable. I wanted to get an iPod but you can watch movies on a PSP portable. You can store movies, pictures, music in that thing and you know what THE SCREEN IS MUCH BIGGER THAN THE IPOD! 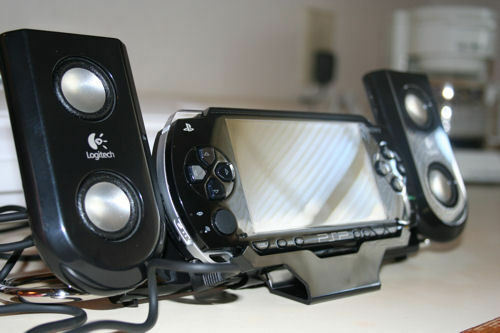 So here I am playing around with the PSP when I see my brother with some portable speakers. So you know what I got that AND a new movie, I scored it at 9.99, used but its in good condition (the movie that is). I am loving my PSP. I want to take it on a walk (like its a dog) but you know what I mean...dont you. I hate to walk alone, but I have no one else that will go with me. So I wanted something to keep my "company" know I have my Portable. You see it...there it is mounted on its speakers! Isnt it beautiful???? I was jamming out early today, with Luna, my cat, as my audience. So then I go to my local scrapbook store. I have not scrapped in a LOOOONNNNNNGGGGGG TIME!!! Since before school let out for summer!!! YEAH ITS BEEN THAT LONG! I have so much to catch up. So I go to the store, because Jesykah is now at PT Pre-K and I have nearly 3 hours just for me Mondays, Wednesdays and Fridays (Tue. and Thur I have Eng Comp at College). I talked and talked and talked with Jenny the store owner, she is super nice. I had my 'list' of the pages I NEED to make but she got new toys since the last time I visited her store and what I mean by toys I mean gadgets to make your pages look pretty. 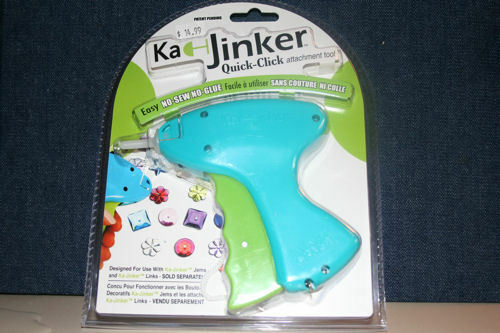 So i find this new gadget that tags stuff to your pages even cloths like the gun used to put on price tags on cloths! it is awesome. I have tagged my daughters school jacket with a pink flower. Anywhooo, I LOOOOVVVEE it and want to share my find. The cool thing is that you can use it for attaching things to your pages...you know like a tag or maybe a text box to your page for writing. Then if you like to sew or want to add bling or pizzaz you can add it to your stuff I saw a cool idea to add them to the bottom of the pants! It was awesome. Im glad I went to visit her. I bought some other things like these glue dots that dont mess up when you touch them. You can actually mess with them, make them bigger, smaller and they dont get yucky because of the oil in the fingers. Really cool. so enough of my blabering. I hope you enjoy my finds! Happy Gadgeting! I remember when I brought my oldest home from the hospital in Ft. Hood Tx. She was very very small nearly 1 1/2 months premature. She looked like those dolls you buy for little girls. Now my cheer, flip-flopping, back hand spring shorty is 10!!!! Time is flying...she is so happy but she has now hit the double digits. Oh boy...3 more years and I have a teen in my hands...does someone have a remote to rewind all this??? Its has been fun so far and its going to get better! I took the leap...I'm on Etsy! Rosa Dolce is now in Etsy!